We can look to where else the word “praus” is used in the Bible to gain a deeper understanding of what God wants from us in being meek. 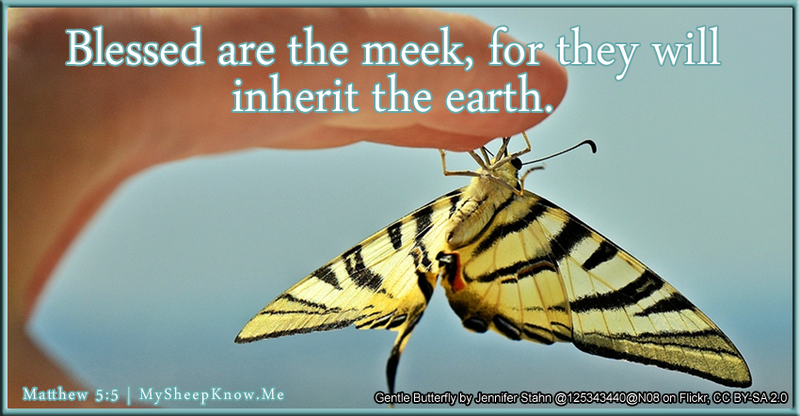 Jesus said in Matthew 11 that to be meek means to learn from his gentleness and humbleness. See, your king comes to you, righteous and victorious, lowly and riding on a donkey (Zechariah 9:9). It also means that your beauty not come from how you look but from your inner spirit, treating all with gentleness. Your beauty should not come from outward adornment, such as elaborate hairstyles and the wearing of gold jewelry or fine clothes. Rather, it should be that of your inner self, the unfading beauty of a gentle and quiet spirit, which is of great worth in God’s sight (1 Peter 3:3-4). In obeying God in this, he promises that we will “inherit the earth.” The Bible tells us that one day this earth and heavens will end, and that those who obey God will be spared his terrible judgments and receive a new heaven and a new earth. For truly I tell you, until heaven and earth disappear, not the smallest letter, not the least stroke of a pen, will by any means disappear from the Law until everything is accomplished (Matthew 5:18). Above all, you must understand that in the last days scoffers will come, scoffing and following their own evil desires. They will say, “Where is this ‘coming’ he promised? Ever since our ancestors died, everything goes on as it has since the beginning of creation.” But they deliberately forget that long ago by God’s word the heavens came into being and the earth was formed out of water and by water. By these waters also the world of that time was deluged and destroyed. By the same word the present heavens and earth are reserved for fire, being kept for the day of judgment and destruction of the ungodly (2 Peter 3:3-7). I looked, and there before me was a white cloud, and seated on the cloud was one like a son of man [Jesus] with a crown of gold on his head and a sharp sickle in his hand. Then another angel came out of the temple and called in a loud voice to him who was sitting on the cloud, “Take your sickle and reap, because the time to reap has come, for the harvest of the earth is ripe.” So he who was seated on the cloud swung his sickle over the earth, and the earth was harvested. Another angel came out of the temple in heaven, and he too had a sharp sickle. Still another angel, who had charge of the fire, came from the altar and called in a loud voice to him who had the sharp sickle, “Take your sharp sickle and gather the clusters of grapes from the earth’s vine, because its grapes are ripe.” The angel swung his sickle on the earth, gathered its grapes and threw them into the great winepress of God’s wrath. They were trampled in the winepress outside the city, and blood flowed out of the press, rising as high as the horses’ bridles for a distance of 1,600 stadia [about 180 miles] (Revelation 14:14-20).